Bruschetta with Kelsey D’s made my week. Remember when I told you that I’ve never won anything? Not entirely true. 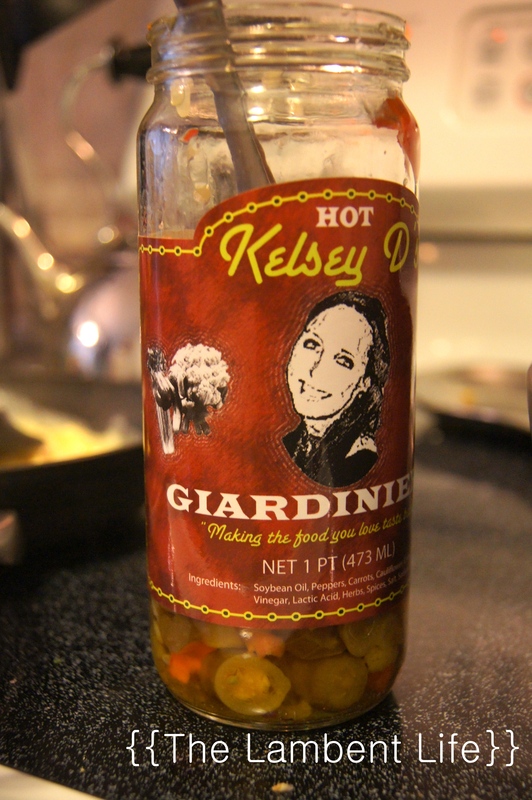 Earlier this month, I won a giveaway over at The Midwest Maven for a jar of Kelsey D’s giardiniera. A jar a-wha?! Folks. If you’ve never spent time in the midwest, book yourself a flight. Check out the sights, the sounds and the eats. Amongst the yummy goods you’ll encounter, if you’re lucky, giardiniera will be among them. Kelsey D’s is a Chicago-based company and makes a giardiniera (which is, appropriately, Italian for “gardener”) that uses a blend of fresh, garden-grown peppers, carrots, cauliflower, celery and gherkins marinated with oils and spices. It’s a traditional Italian condiment but is yummy enough to be added to really any style of cooking. It’s pronounced “jar-di-NAIR-a” but it doesn’t matter because your mouth will be full of the stuff and no one wants to hear you speak with a full mouth, anyway. These bad boys have been hanging out in my pantry since the beginning of the month because we’ve had so many guests and sometimes I just don’t want to share with different dining palates, we held on to them until we had time to experiment. After tonight’s meal, I’m disappointed I missed three weeks of my life, during which I could have been enjoying Kelsey D’s. But incredibly, selfishly glad I’ve managed to hoard the stuff for myself (and a few bites for J, when he begged). 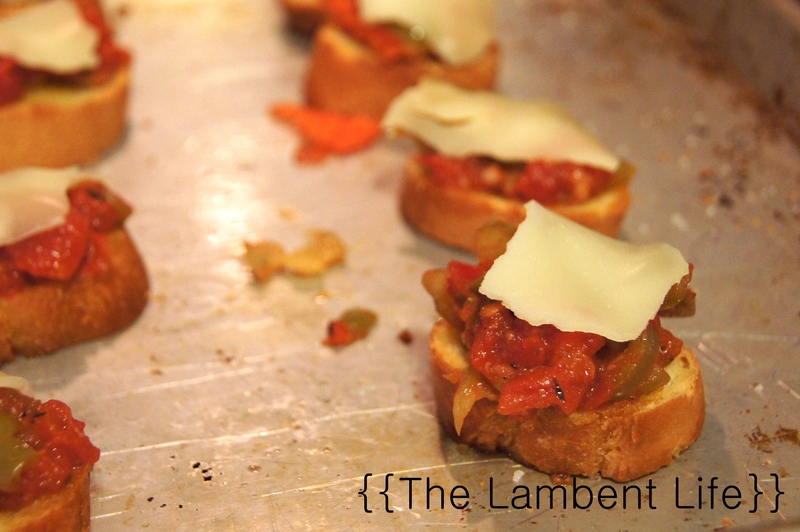 Tonight, I made the most delicious bruschetta I’ve ever had the pleasure of introducing to my belly. I didn’t follow the Kelsey D bruschetta recipe because a.) I’m a poor planner and b.) it used salami. But if I could toot my own horn, I would. It was that good. In a large skillet, heat the oil and add the garlic. Saute for a minute. 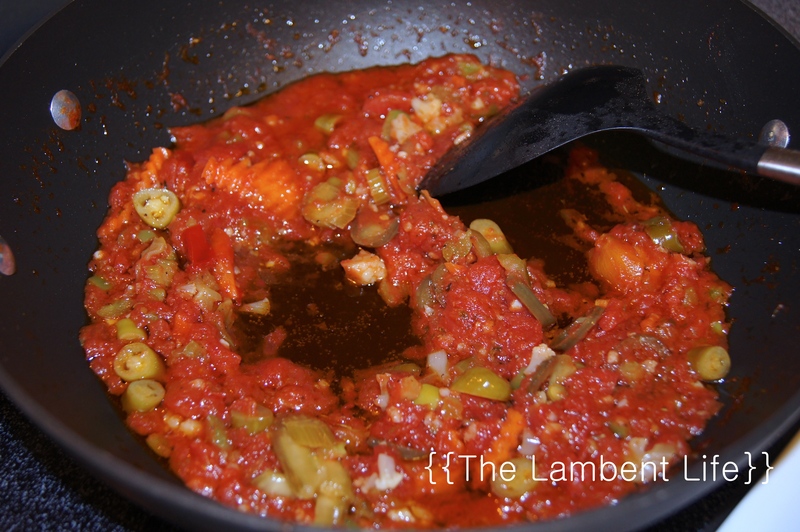 Add the tomatoes and their juice, green pepper, italian seasonings, salt and pepper. Let simmer for about 5 minutes. Add a healthy portion of giardiniera, 1/3 to 1/2 a cup. This stuff is good so you can’t really use too much. Let simmer for about 5 minutes. When the mixture begins to simmer, slice the baguette into 1/3 to 1/2 thick pieces. Brush each side with olive oil and place on a cookie sheet. Add a pinch of sea salt to each piece and bake in the oven at 375° for about 10 minutes. Spoon a healthy amount of the tomato/giardiniera mixture on each piece and put back in the oven for another 5-10 minutes. Remove from the oven and, if so desired, add a small piece of provolone (or mozzarella) to each piece and continue to bake until melted. I made a few without cheese and they were also very, very good. Serve hot, warm or even room temperature because any way you eat them, they’re awesome. Yes, my cookie sheets are that ugly. 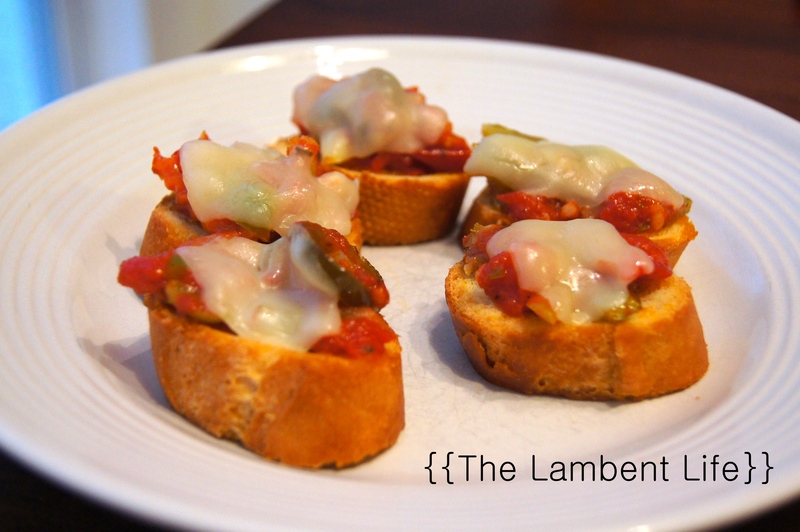 Have you ever had giardiniera? What’s your favorite Italian food? Sometimes I’m overwhelmed by feeling too much. Sometimes I wish I could just turn down the volume and hang out in some sort of muted version of the real world. I wish that I didn’t care, that I didn’t feel convicted, that I could live in ignorance. Someone somewhere once said that when you know better, you do better. But what are you to do when what you know makes you so overcome with feelings, it’s hard to do much of anything? Today’s post is a bit out of the ordinary. I don’t really have a purpose for posting except for my heavy heart and need to work through some thoughts. J and I stayed up past our typical 10:30 p.m. bed time last night to watch the Opening Ceremonies of the Olympics in London. We had a good laugh at the bizarre social media circus performance but settled in quietly to watch the Parade of Nations. My mood quickly went from festive to somber. I survived kayaking and a night out. Hi, kids! Sorry I’ve been away. We’ve been having loads of fun with our out-of-town visitors but I wanted to pop by and let y’all know I’m still alive and didn’t get eaten by sharks while on our kayaking adventure extraordinaire. On Friday, J and I had a day/night away from the girls – the first of its kind. It was like the stars aligned: J was able to get time off, we had family willing to take on the challenge of our two SO!MUCH!FUN! 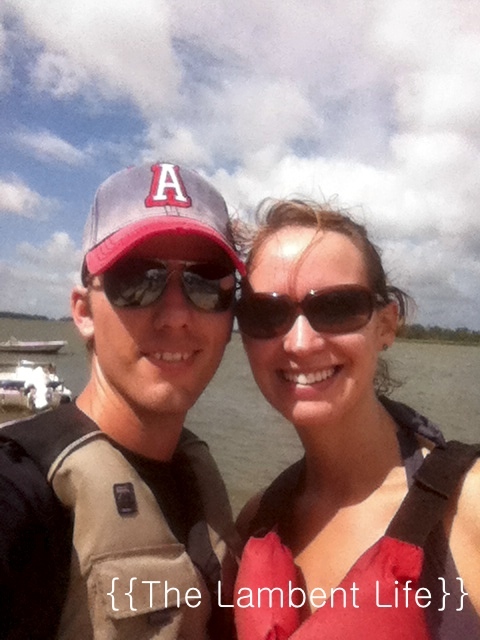 children for 24 hours, and a livingsocial voucher for kayaking. J had been trying to get me out on a kayak since 2003 but I have this little oh, no big deal fear of water. I like the ocean where I can see it – below my knees. But I humored him and we set out on a three-hour tour. We had a rough start to the trip. The rental place was grossly understaffed and it took us about an hour to fill out paperwork, get life jackets and get the kayak loaded in the truck. We decided to paddle out from the southern point of Tybee Island and head towards Little Tybee, an uninhabited island only accessible by water. Is it really Wednesday? Where has this week gone? It has been an unusually hectic week for us with no signs of slowing until August rolls around. And then, it’s more go, go, going. I have plans tomorrow morning to meet up with a friend visiting from our previous life in Ohio. Dear children, be kind to your mother and please don’t terrorize this sweet couple into never having kids of their own. Tomorrow evening, family arrives for a nice vacation. And on Friday, J and I will be leaving the girls for a much needed, belated anniversary celebration. I’m all kinds of Jessie Spano excited as it will be the first time leaving the girls overnight. But they’ll be in good hands and Drama Baby probably won’t even notice we’re gone until 2 a.m. when she wakes unable to find her binky and screams, convinced it’s somehow my fault and that someone stole it. Simple bread recipe for a simple life. I find it interesting to hear how other people began their journeys to live a simpler life, a return to a simpler time. Ours began with a loaf of bread. When E was about 6 months old, and I unexpectedly found myself as a stay-at-home mom. Up until this point, I wasn’t terribly domestic and prided myself as a career-minded woman (not that you can’t be both, I just wasn’t). With E’s birth, it was as if my eyes were opened to how crooked our lives, priorities and health had become. Here was a blank slate of purity, a perfect little untarnished being. How was I going to raise her to guard the heart and health that was naturally gifted to her? 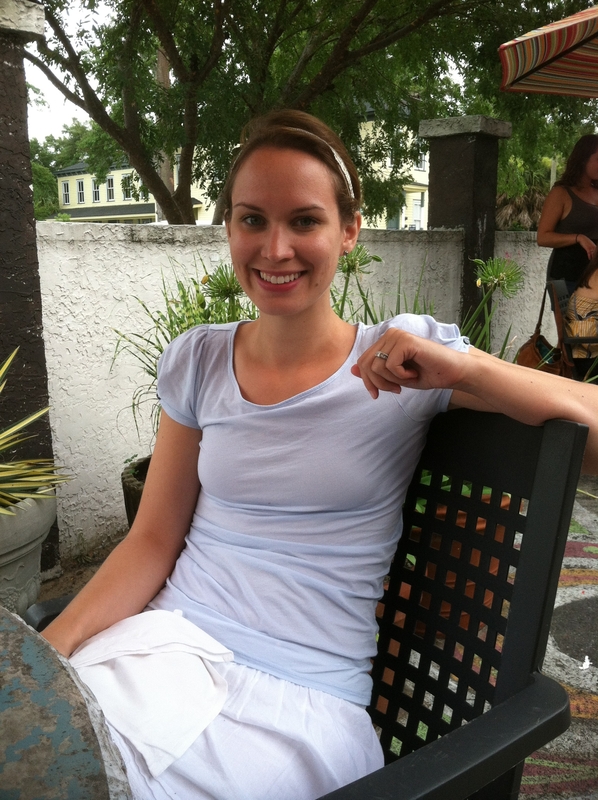 As I became more conscious of our lifestyle, I began reevaluating everything. Was it necessary? Was it honest? Was it good? One thing that caught me off guard was a loaf of bread. We had made the switch to whole wheat and assumed it was better for us. But in a loaf of traditional store-bought, 100% stone ground whole wheat bread, there is 23 ingredients. Twenty-three! Sometimes I spend more time tinkering around Wordpress than I do actually blogging. I sat down this afternoon and again this evening to write an update on our 30 days sans meat but instead spent my time adjusting widgets and themes and OH, catching up to 2008 and joining twitter. I feel so technologically inept. The worst part is I just don’t have the time to learn all the tricks and tools of the trade. Between switching to a Mac, beginning a blog and now, joining twitter, I know how my parent’s generation felt when the internet boomed and suddenly everything was all AOL, LOL, and TMI. I feel dumbbbb. And like everyone else magically knows how this whole social media world goes round and I’m all Whaaaa? Can I fax it to you? Someone please tell me I’m not alone. I swear I wasn’t this dumb when I worked in PR. I’m amazed at how much social media has changed since I left the workforce in late-2009. Shoot. (Say that with a southern drawl, sheeeeewt). As for my originally intended post, our 30 day vegetarian diet is going swimmingly. J and E are camping tonight (someone obviously put on their crazy pants this morning) and despite my reservations, received my blessing to have hot dogs on the campfire. Something about the experience, blah, blah, blah. Not the hill I wanted to die on. I made the most fantastic meal last night – veggie fried rice – but was too busy stuffing my face to take a picture. It was so, so, SO good, I will most certainly be making it again and will actually note the ingredients and measurements to post. In fact, I may scratch my plan for take out and eat the leftovers tonight (for the second time today). How tech savvy are you? Any yummy, vegetarian camping foods? Hey, Hey, Whatchu Wanna Know? I’ve been writing to you kind folks for a few months and although I’ve shared about our lives, I don’t think I ever took the time to properly introduce myself and my little clan. I never really know how to describe people or what people really want to know, so I’ll just share a load of random, unrelated and probably uninteresting facts which I think is much more telling than any stinking résumé. We’ll start with E. She’s 3 years old and on any given day can be found wandering the house demanding that everyone walk the plank or begging, pleading that I turn on My Big Big Friend. She has amazing hair and is obsessed with bugs. E has a bizarre quirk similar to Brick on “The Middle” and always, always repeats back the last word spoken to her. Dirty Little Clean Living Secret #3: The Wormy Bin. We go through a lot of fresh food each week – fruits, vegetables, eggs, herbs and so on. Obviously, eating fresh is cleaner for our bodies and the environment but it does result in a bit of kitchen waste. Banana peels, watermelon rinds, carrot shavings… it adds up. But this organic matter is 100% reusable with vermicomposting. Vermi-wha? Vermicomposting. A worm bin. When Hub first mentioned making one of these bad boys, all I could think about was Archibald and his worm babies from Yo Gabba Gabba. I’m pretty sure my arms flailed just like Brobee’s when I first saw our worm babies in the wormy bin. Scaling back the adventure and tasty summer treats. Our first week is almost over and I’ve found the transition to a meat-free diet to be pretty easy. I don’t find myself craving it and we have enough variety in our diets that I haven’t gotten bored. We’re still eating very balanced meals and have managed to stay away from packaged convenience foods with the exception of the occasional veggie burger. The biggest issue I’m facing is with my ego. After a few failed dinner attempts, I’ve come to terms with the fact that I am no vegetarian Ina Garten. Yet. Usually, I can hold my own in the kitchen. I can deconstruct and combine recipes and swap in our preferred ingredients. I can get a taste rolling around in my mind and find a way to create it. But cutting out meat has forced me to step outside of my cooking comfort zone and try recipes that use a lot of new and unusual ingredients. Some ingredients have sent me across town to five different stores and without being too familiar with them, I can’t really say it’s worth the effort or if they are easily omitted. Happy Fourth of July, folks. Things here at The Lambent Life household are unusually, yet pleasantly quiet today. Hub is home from work and instead of filling our day with fun festivities and summertime activities, we decided to skip it all and just hang out together. It’s so incredibly rare to have Hub home during the week without something to do or somewhere to go. Even our weekends are jam-packed between the market on Saturday and church on Sunday with other errands and nap time sandwiched between. So we took today as an opportunity to just catch up and be (cute). A trial-by-fire momma of two feisty girls. Lover of real food, wellness and obscure facts. Serving a Lord of endless grace. Searching for the local, holistic and genuine. My daughter thinks she has a boyfriend. Giving up caffeine: It’s not you, it’s me. Why traveling with kids is worth losing my sanity. Content found and stories shared on this site are my own and are for information and entertainment purposes only and to encourage you to be proactive in your own journey to health. Please, do your own research and consult with a trusted medical professional before embarking on any dramatic lifestyle and dietary changes. I am not a doctor and nor do I get paid like one.